Every year in football, there are a few players that really shine. Rarely do we see people dominating the scene for more years, while a truly dominant career is something very, very rare. Current football fans seem to think that Messi and Ronaldo are unique players, whose stats have not been repeated at any time in history. While this is partially true, there certainly were players in the past who not only achieved great success, but also changed the game with their style, their intelligence and their flair. Among them, without a doubt, we can find Marco van Basten. 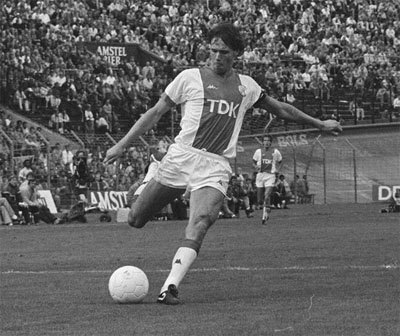 Marco van Basten as the striker in Ajax. Born on the 31st of October 1964, the Dutch striker is one of the most influential players who have ever played the great game. His professional career spanned for more than 10 years, during which he made 373 appearances and found the net 276 times for the clubs he represented. He also went on to make 58 appearances for his national team and score 24 goals. Marco van Basten was not a very athletic striker, contrary to popular belief, but relied on intelligence, close ball control and flair. After retiring rather early from his playing career, van Basten also started a managing career and enjoyed reasonable success. Before joining Ajax, where he will know the first major successes of his career, Marco van Basted played for local teams from Utrecht, most notably UVV Utrecht. Ajax quickly signed the young, promising striker afterwards, in the summer of 1981, and first used him during a match against NEC Nijmegen, one in which van Basten also managed to find the net. The next season was the one where he had to prove himself, competing with Wim Kieft for the center forward spot, who was at the time a top striker in European Football. Despite his young age, van Basten did quite well, managing to score 9 goals in 20 appearances. Nobody could have predicted what happened next. 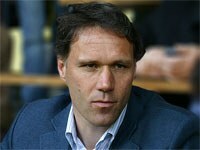 After Kieft’s departure to Italy, van Basten became the main attacking threat of Ajax. He went on to score 128 times in 133 games for the Dutch club over the course of the next 4 seasons, winning the top scorer title in the Eredivisie four times in a row, up until the 1986-1987 season. After winning the Cup Winner’s Cup with Ajax in 1987, van Basten quickly became a very tempting transfer target for a lot of big European clubs, one of which managed to secure his signature. Silvio Berlusconi, the AC Milan chairman, was a big admirer of the Dutch forward and brought him to Milan in 1987. Here, he would form one of the most famous attacking partnerships in the history of football, together with 2 equally famous Dutch players: Frank Rijkaard and Ruud Gullit, who joined in 1988. The first season was not very impressive for van Basten, playing only 11 games due to a severe ankle injury. The next ones were nothing short of spectacular. Van Basten lifted the European Champion’s Cup in 1989, while scoring 2 twice in the last game against Steaua Bucuresti, and went on to play 201 games and score 124 goals in Italy. He does hold another record as the first player in history to score 4 goals in a single Champions’ Cup game, and was a pivotal piece in Milan’s many honors with him in the team: 4 Serie A titles, 2 Champions’ Cup, Intercontinental Cups and European Super Cups, and 4 Italian Cups. Marco van Basten made his debut for the Netherlands senior team in 1983. He became one of the most important strikers in Dutch history; netting 5 goals in the European Championship in 1988 and helping his team win the competition. He will be remembered in football history for his incredible goal in the final with the Soviet Union, a stunning volley from a tight angle that went over the keeper and into the back of the net. In total, he played 58 games for his national team, scoring 24 times. After hanging up the boots following two full seasons on the sidelines due to injury, Marco van Basten went on to coach the Netherlands national team on the 29th of July 2004. Despite having a good overall record that only counted 6 losses; van Basten failed to lead the team to any major trophies. He then went on to coach Ajax, Heerenveen and AZ Alkmaar, and is currently an assistant coach in the Dutch senior team. Marco van Basten is one of the players that can’t only be described by their stats – you have to see him play to truly understand what a fantastic striker he was. His retirement is widely considered one of the most unfortunate in football history, with van Basten playing his last game at only 28 years of age. Named FIFA World Player of the year in 1992 and winning the Ballon d’Or 3 times (1988, 1989, and 1992), van Basten is a key figure in the history of the sport, both internationally and in the Netherlands. His genius will surely teach and delight many generations to come.